UP elections are to being held currently under heavy security.Complete BJP candidate list, for UP elections has been shared by party officials in numerous announcements. Uttar Pradesh Elections will be held in 7 phases in the months of February and March. Results will be declared on 11 March. After the historic win in UP Parliamentary elections, BJP is in full swing to sweep out the UP assembly polls also. Bhartiya Janata Party has started their political campaign in Uttar Pradesh and they are going to announce all of their candidates list soon. BJP has declared fifth list of candidates on remaining assembly seats. The BJP fifth candidate list contains 4 names. 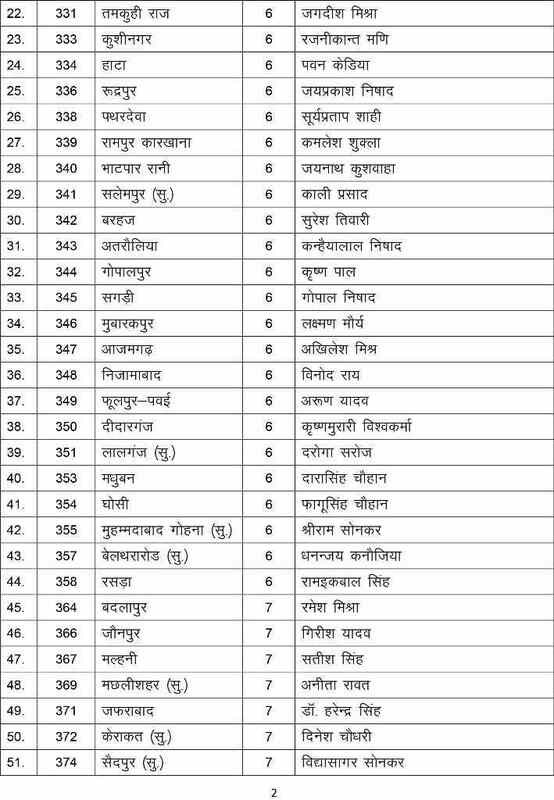 BJP has declared another list of candidates for UP elections on 24th January. The third list has another 67 names of aspiring MLAs. This list has been declared at the evening hours of the day. Now the tally of announced names has reached to 371. The fight for UP elections is very tough and important for the party. A lot of brain storming is going on in the party, to come up with the right names. Some names on remaining constituencies are expected to be declared in the days to come. We are looking very closely on all the election updates and we will share all the list of BJP candidates, once it is declared by party officials. The party is planning to declare the remaining candidates for all 403 seats in a couple of days. In first list, party have declared 149 candidates after keeping everyone on a long wait. The list contained various MLA aspirants from various constituencies. BJP held another meeting on 19th January regarding UP elections, which signaled that second list was to be declared soon. The list was declared at evening hours, on 22 January. BJP shared the name of aspiring MLAs and their representitive on another 155 seats. Voters on remaining constituency will have to wait for some more time. BJP will be preparing the UP candidate lists for remaining seats of Uttar Pradesh and we are expecting that they will announce the candidates very soon. They have announced three lists containing 371 names, but some more names are yet to be declared due to the large number of the legislative assemblies. 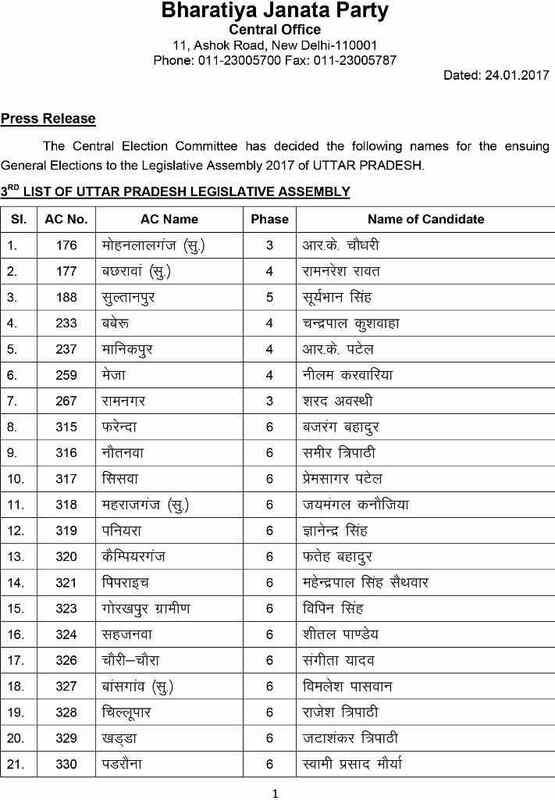 The first candidate list of BJP is declared for Uttar Pradesh elections. It was expected to be declared on Sunday, 15 January. However party delayed it and declared the list on 16 January instead. The list of BJP candidates for UP elections 2017 was anticipated since many days. This announcement clarified the nominations of MLA candidates in the state. 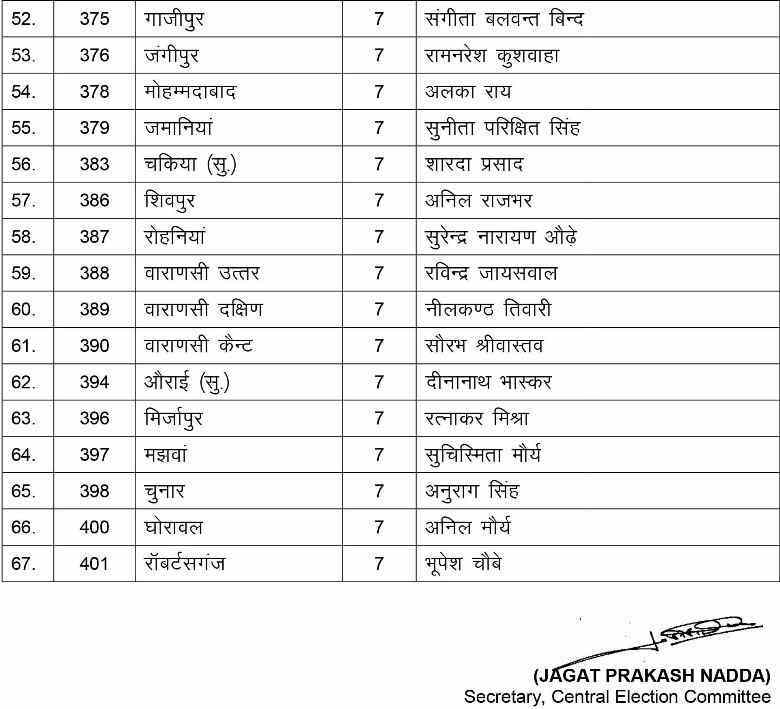 The first list contains name of 149 candidates. MLA aspirants on Remaining constituency seats will be declared soon as the election date is very near. UP assembly has 403 seats and 202 seats are required to form the government in Uttar Pradesh. Bhartiya Janta Party might create an alliance in UP polls with regional parties. We will update the MLA candidates list as soon as party declares.